When we checked into our villa in Bali after a five hour flight from Hong Kong, we thought we'd arrived in paradise; the memory of arriving at that hotel is one that I'll remember for a long time. We walked up candle lit stairs to reception; no walls, just a roof which was pretty amazing considering the hotel is built in the middle of an Indonesian forest. Once we had established that we were not here on a honeymoon, just on holiday, Andrew got on with filling in the forms. 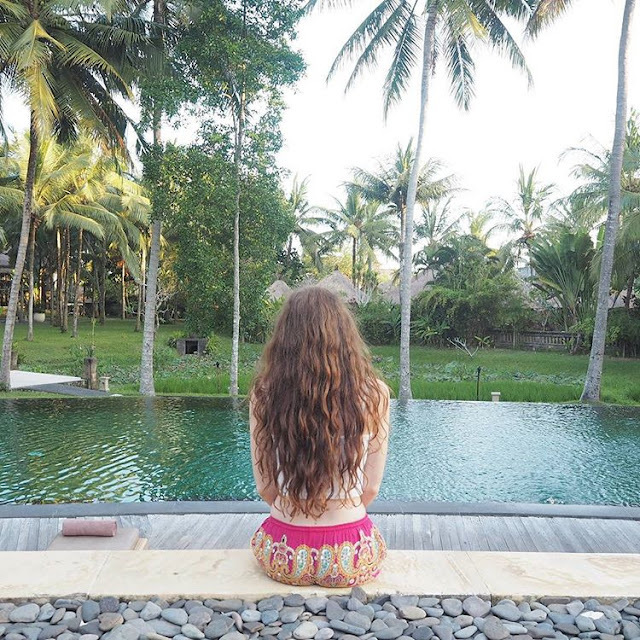 I was still a little bit overwhelmed and just needed some time to take everything in; the smell of incense, the Balinese music playing in the background and the sun setting over the treetops. And then the excitement hit me, if this was only the reception, what on earth was our room going to look like?! We weren’t actually staying in a room, we had booked a garden villa and neither of us knew what to expect, we've always stayed in hotels before. With dinner reservations to get to we quickly hopped on the back of a golf buggy and were driven through along the little forest paths, twisting and turning around corners through the forest until we arrived outside a wooden door, shut with a padlock. and reflecting off of the pool; Our own private pool, all to ourselves. Complete with two sun loungers, a day bed and a table and chairs. 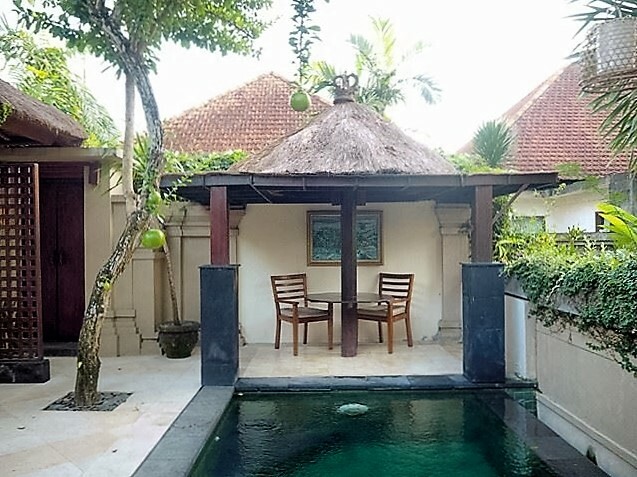 We were only in Ubud for one full day and we had planned a tour of the town and its temples but after a glimpse of what we had, we agreed to keep our tour as short as possible to give us time to enjoy the villa too. So off we wandered along the forest path in search of breakfast which is served in the hotels restaurant; just through the trees. Eight thirty and it was already boiling hot so we decided to sit upstairs which had a lovely view over the resort and the women working in the rice paddies next door. There are only 30 villas at the resort so we hardly saw anyone around apart from then where we were one of three couples at breakfast. I started my day with a plate of fresh fruit, followed by an open breakfast burrito; my first taste of avocado in weeks and it was delicious! After breakfast we met our guide ready for a day of adventure in Ubud but more on that in another post. We were very excited to arrive back at our villa by 2pm giving us loads of time to enjoy it! Being able to spend the afternoon by our private pool was such a luxury; I could mess around with the selfie stick as much as I liked, go back inside if we wanted something and there was even a plug by the daybed so I could charge my phone. Apart from the normal things, for someone with OCD, I loved not having to check where all my stuff was constantly - it didn’t matter where I left my phone or my raybans because Andrew was the only person there and I didn’t have to worry about him stealing them. It meant that I could close my eyes, and fully relax. After a splash around, and realising that it was our last evening, we decided to have a little explore around the resort; but first we needed to wash off and that meant time for a dip in our huge stone bath in garden at the back of the villa. By about 5:30 we were ready for a snack and stopped off at little poolside bar for a spot of afternoon tea. We drank red rice tea and ate spring rolls with fried banana fritters for sweets which was just enough to keep us going until dinner. We found the communal pool lined with palm trees and lots of hidden huts dotted around the resort and made our way back to the room to get ready for dinner just as the sun was setting. After dinner it was time to go back to our villa for one last time, walking through the forest path to our packlocked gate. The resort had such a relaxed vibe, we fell asleep in the four poster bed to the sound of the birds chirping outside before our next adventure in the morning.. It looks so nice and that bath is stunning! It seems that you had an amazing time! :) Beautiful pictures! Oh GOD that looks so dreamy! That bath tub / private pool combination is just so stunning! 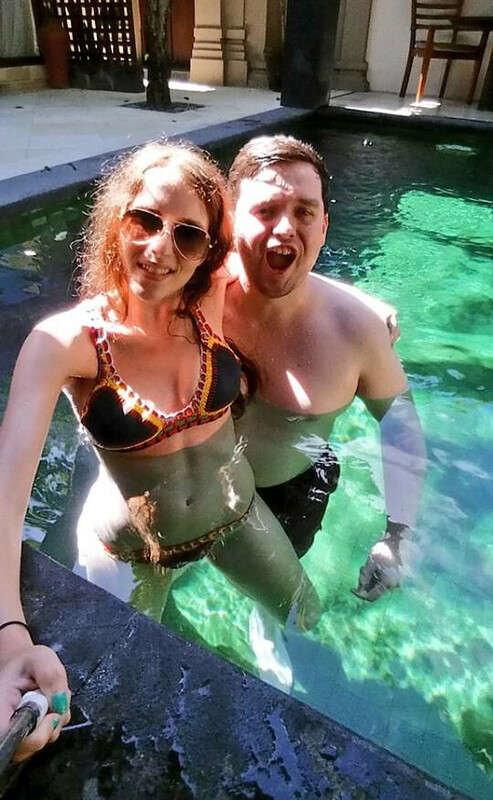 Hope you had an amazing time lady, I've always wanted to visit Bali! Oh my goodness...that looks heavenly and VERY relaxing! Bali looks incredible - so jealous, I'd love to go! wow ! what a nice blog . i don't see it before . thanks a lot of . click>> baliswim for more .